Holy Crepe! What’s Up with the Line at Sophie’s Crepes? 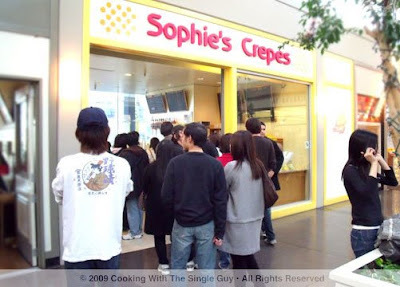 Awhile back I was walking around San Francisco’s Japantown when I noticed a big crowd outside Sophie’s Crepes, located on the second floor of the indoor mall (on the side closest to the Sundance Kabuki Cinemas). I’d seen the tiny crepe shop in the past, but never with this crowd. So you know what that meant? That’s right. Taste test. I got in line and looked over the menu. Sophie’s sells both savory and sweet crepes, but of course the sweet crepes are the most popular (think Nutella and Strawberries vs. Turkey and Cheese). I ordered one of the Japanese specials, which looking over my notes I’ve realized I forgot what they called it. They should have named it “Sophie’s Choice” and I totally would have remembered that, but instead it was called something else. 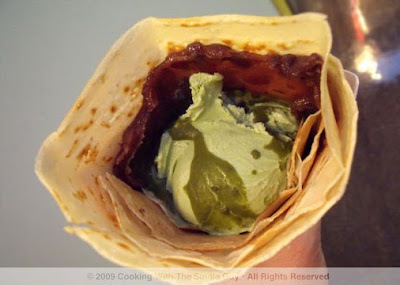 Anywho, it had green tea gelato and red bean paste (azuki beans) and a special matcha (green tea) sauce. This sold for $4.70. While I waited for my crepe, I would have taken pictures of the workers making the paper-thin crepes in the front, except Sophie’s had a very big “no cameras” sign posted outside. So all you get is this photo of my Japanese-special-I-forgot-what-it-was-called crepe. The tiny shop doesn’t have many seats so most people get their crepe to go. It’s delivered to you like a cone. 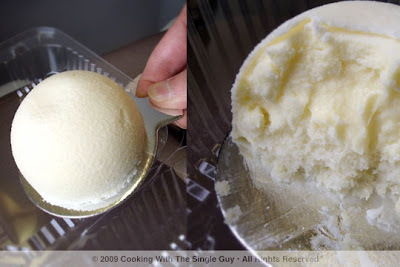 I didn’t know how I was supposed to eat it, so I got a spoon and started to scoop the gelato. Oh. My. Gaawd. It was like spooning cement. I couldn’t cut through the thick green tea gelato, and my plastic spoon literally bent to the point I was worried it’d flick into two and go flying into the crowd like some ninja star. So I gave up and instead flattened my cone and started to bite into the crepe like an ice cream sandwich. Mmmm, this method worked out great because I got to taste the slightly crunchy crepe and the thick gelato acted like glue to keep all the ingredients in place instead of oozing off the sides. I don’t know if it was designed to be eaten this way, but it was the only way I could finish this. Overall, I thought the crepe was just OK and I really liked the red bean paste. But I didn’t like the green tea gelato. I have a feeling the lines at Sophie’s may be an indication that there are so few sweet options in Japantown when you’re looking for something cold like ice cream or gelato. Time to mosey on along. Nothing to see here. You might be surprised to hear that I only subscribe to one food magazine. And it’s not because I think it’s the greatest. It’s just I have little time to read various magazines every month, so I limit my subscription to just the consumer standard Food and Wine. I admit I like to flip through Food and Wine mostly for the pretty pictures. Their overall design is contemporary and easy-to-read. And over the years, I’ve clipped out many interesting-looking recipes but rarely do I ever try them. Until now. I’m going to start this new monthly feature called “Test Kitchen” where I’m going to pick a recipe from my Food and Wine magazine and make it, then give you my thoughts on how easy it was to make and more importantly, how it tasted. From my current April edition of the magazine, I’m actually kicking off with a fairly easy recipe. In fact, it’s from the Tasting and Testing section of the magazine. 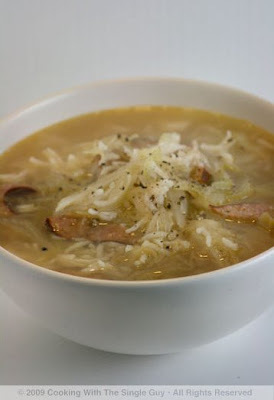 This Cabbage, Kielbasa and Rice Soup sounded interesting because I like soup with grains in them but never really made them myself since I’ve mostly made pureed soups. You can find the complete recipe here at the Food and Wine site. And here’s how it turned out. How do you think my soup below compares to the Food and Wine photo above? The recipe makes four servings. If you don’t plan to eat it all in one sitting, I would recommend keeping the rice separate and adding it in to the portion size you plan on eating right before serving. If left sitting in the soup, the rice will absorb the broth and get really mushy. I cheated and used my rice cooker to make my basmati rice. I’m sure that’s allowed. Ease of cooking: This is a really simple soup to make, and can be a quick last-minute dish to make for a weeknight dinner, served with a small salad or some toasted bread. I like these types of recipes that don’t call for any unusual ingredients or very many of them. 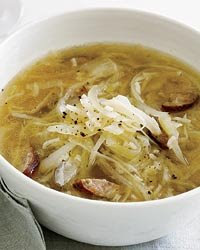 Taste: This seemed like a healthy approach to eating as well because the recipe called for low-sodium chicken broth. But I have to say, it really lacked flavor and body, even when adding the sausage. I felt like it would have been better and more substantive if I added some white beans, for example. If you’re also a Food and Wine subscriber, email me your vote on which recipes I should try each month. You can start with the May edition when you get it at home soon. Lunch daily (except Sunday) from 11:30 a.m. to 3 p.m., dinner daily from 5 p.m.
My nephew Chris was in town last week for spring break, so that gave me an excuse to go out for Chinese food. Typically, I find it hard to get Chinese food as a solo diner, especially for dinner, because you can’t get to try as many dishes. 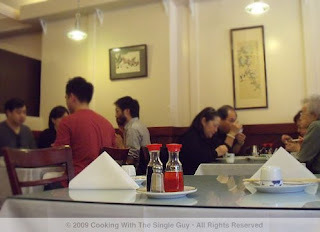 So I met Chris and his girlfriend, Mary, and the three of us feasted at the Great China restaurant not too far from the University of California-Berkeley campus. Great China is a tiny restaurant just a few steps from the California Theater. From the outside, it looks like a small, family-owned Chinese restaurant—the kind you’d see on the road to Modesto or somewhere outside the city. But inside it’s pretty spiffy with upscale dining sets and a banquet-hall décor. The place is still tiny, though, with only a few tables in the front and more in the back in what seems like a mezzanine? 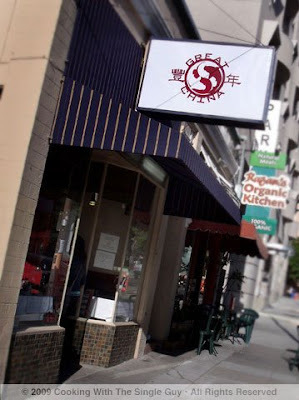 (It didn’t seem like enough stairs to make it a “second floor.”) We got there early on Friday night because the word has been out for awhile that Great China is one of the best Chinese restaurants in Berkeley, if not the entire East Bay. The restaurant even has several house specialties that have added to its reputation. Some of them I heard from friends, such as the classic Peking duck—a whole roasted duck that needs to be ordered at least a day in advance. Also a starter called “Double Skin,” which is primarily a cold salad made up of mung bean noodles tossed with various vegetables, seafood and pork. That’s because the Peking duck is the dish where the crispy roasted duck skin is carved off and served with a bun, hoisin sauce and green onions. Then you eat the meat separately. It’s been a long time since I’ve eaten duck skin, and I felt a whole duck with accompanying buns would be too much for three people. As for the “Double Skin,” it sounded interesting but I wasn’t in the mood for a cold starter. So enough about what I didn’t order. This is what we ended up eating. We started with the Sizzling Rice Soup ($6.25 for a small order), which is a clear broth soup with chicken, shrimp, mushrooms, water chestnuts and peas. It’s a clean, refreshing soup, and it gets its name from the puffed rice (just think of Rice Crispies) that’s added to the soup at the last minute. When the rice hits the soup, it creates a crackling sensation, or sizzle. Thus the name, Sizzling Rice Soup. Chris said he didn’t remember eating this soup growing up, but I’ve had it a few times and enjoyed it as a child for the sizzling action. 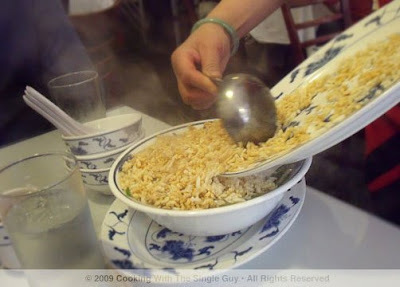 The soup didn’t disappoint when the waitress poured the plate of puffed rice into the soup at our table. It sizzled and let off some steam, too. The soup tasted just as I remembered—clean and simple. But it’s accentuated at Great China by the fresh ingredients in large portions. 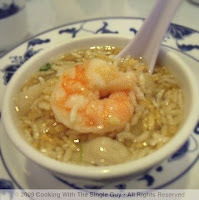 My only gripe is that they put too much rice in the soup, crowding our bowls with the toasted starch. Even though we skipped the Peking duck, Chris had a hankering for duck, so we got the Tea-Smoked Duck ($11.95), which is more manageable at half a portion instead of a whole duck. 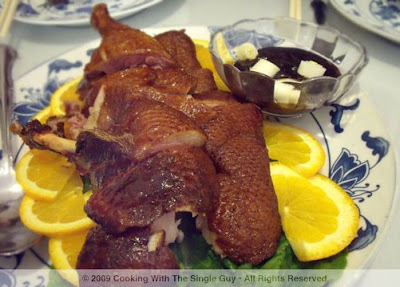 The duck arrived with a nice color to it and when I bit into the pieces, there was a nice smoky flavor. But because it’s a smoked duck, the meat was more like preserved meats so it was tougher to chew into. This isn’t the kind of dish one would describe as “fall off the bone” because it didn’t. A lot of the duck fat also wasn’t rendered off, so you could see the fatty goo in every piece just right under the skin. I found this course really difficult and unhealthy to eat, but naturally Chris loved it because he’s still young enough where he doesn’t worry about his cholesterol. The duck also came with steamed buns, which I thought was unusual because it didn’t have a slit to allow you to stuff it with some duck meat. 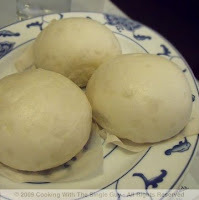 I guess the bland buns are the chef’s way of helping your body absorb all the duck fat. 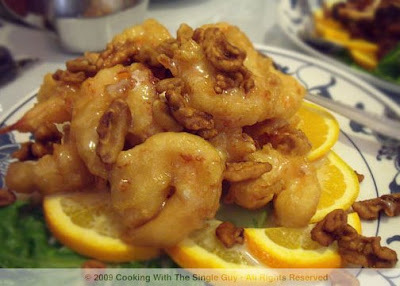 Another house specialty is the Walnut Prawns ($13.95), which is sometimes listed at other Chinese restaurants as Shrimp with Honey-roasted Walnuts. This is another one of my favorite dish growing up, despite the fact that in making the shrimp the chef has to quickly deep-fry the shrimp to make it crispy and then coat it in a sauce that contains mayonnaise. Yes, you read right. Great China’s version was presented nicely, and Mary and I both really enjoyed the prawns, which were quite huge. The walnuts, on the other hand, seemed small in comparison and tasted a bit stale. It lacked a real crunch. 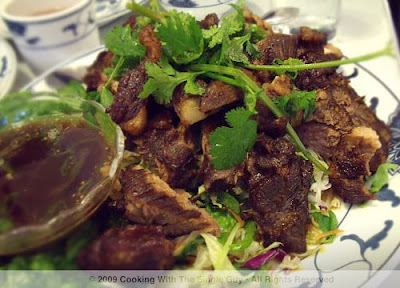 Next up was the Wok-braised Lamb ($10.50), which is a dish made up of pieces of leg of lamb that are marinated, steamed and then braised before they’re fired up in the wok for some color. The dish is served with a light soy-based dipping sauce. I really enjoyed the lamb because it had a nice flavor that was not super gamey (which turns some people off) but still had enough of its distinct lamb flavor to make it intense and hearty compared to generically raised cattle. And it was super tender, the kind of dish one would describe as “fall off the bone” if it actually were served with the bone still in. The accompanying dipping sauce, however, was a throwaway. I didn’t feel it added to the flavor when I dipped my piece of lamb in it. A big gripe I have with Chinese menus are that they’re heavy on the meats, so I try to off-set that by at least ordering a side of greens. For our dinner we got a simple order of stir-fried Black Mushrooms and Chinese Vegetables ($7.95). Great China typically serves bok choy in this dish, but I asked the waitress to substitute it with baby Chinese broccoli or choy sum, which is a greener vegetable. The dish was simple and nicely prepared—nothing fancy—but served the purposes of bringing some balance to our meal. I don’t think Great China has any specialty desserts because near the end of our meal the server brought our check with some slices of oranges and fortune cookies without us even asking for it. So a moment about the service: It’s kind of what you would expect at a Chinese restaurant—efficient but gruff at times. Most of the servers speak English but seem more comfortable with Mandarin. They get their job done, but don’t expect a lot of friendly suggestions or help. I wasn’t too concerned about dessert because we did have a big feast and there are a couple of frozen yogurt and gelato shops nearby. It was nice having a family dinner, and Great China offers an interesting menu to help create a nice assortment of dishes. The quality of the ingredients and cooking style is nicer than most Chinese restaurants, but I wouldn’t say it’s the best. Maybe in Berkeley, but not the entire East Bay. What's This at the Temescal Farmers Market? Anyone know what this is? It's a vegetable, I give you that. But isn't it unusual looking? 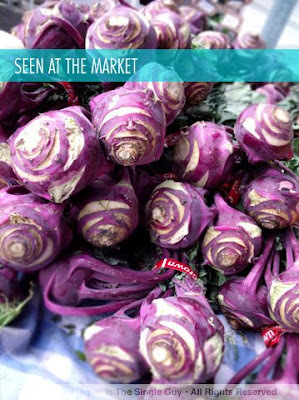 I spotted it at the Temescal Sunday Farmers Market in Oakland awhile back, and then I bought a bunch just out of curiosity. OK, some of you might know that this is called a Kohlrabi. I know, you're still saying "what is that?" Me too. The guy at the market says it's super sweet when roasted, but when I got home and did a quick Googling job, it says it's more like a radish. 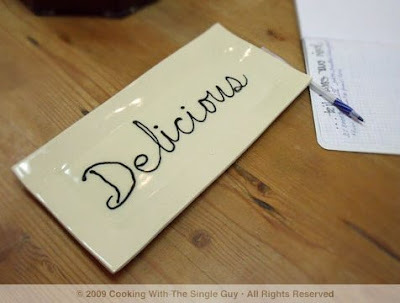 A common recipe is to make it into a cole slaw because it has less bite than a radish. So I just shaved them into slices and made a crunchy salad. It was interesting and definitely like the texture of a radish, but without that sting. If any of you grew up with this (I think it's popular in Germany), tell us how you prepare it and what's your favorite dish with this unusual veggie. Open daily, 11 a.m. to 9 p.m.
Quality quick-and-convenient food is hard to come by. That’s probably why fast foods have gotten such a bad rap because they often mean low prices but unhealthy options. And places that have quality food often mean higher prices and a bit of a wait. 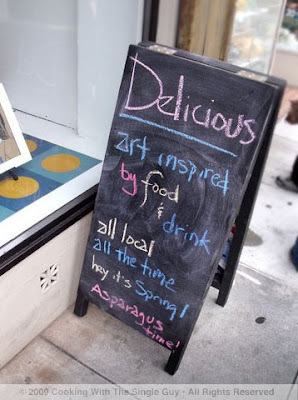 Amanda’s Feel Good Fresh Food in downtown Berkeley may be on to something. The new fast-food-like eatery promotes good eating with fresh salads and organic, sustainable products like their 100 percent natural beef hamburgers and baked potato sticks ala French fries. I discovered Amanda’s recently after visiting the Berkeley Saturday farmers’ market. 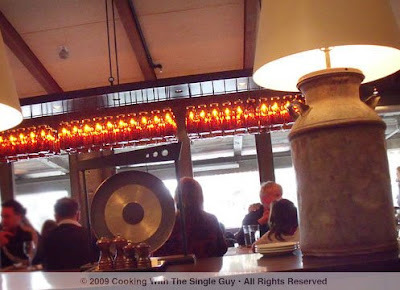 Opened since summer 2008, the place is clean and friendly, offering an Earth-friendly motif of frosted glass with bamboo and a huge communal table that the owners promote as a “picnic table” for people to gather. The restaurant was opened by Amanda West, who is not a chef but worked in the tech industry until she got a job at Niman Ranch. There she learned about high standards for sustainable foods, and she was inspired to come up with this healthy fast-food eatery after watching that “Supersize Me” documentary a few years back. 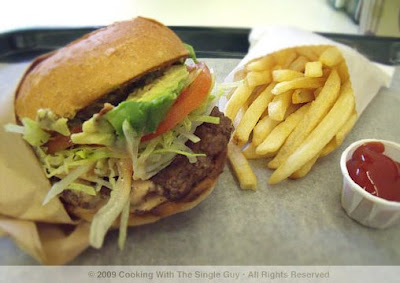 The menu consists of several burgers (beef, grilled chicken and veggie) and huge salads. Everything is served in compostable packaging, and every detail supports Amanda’s health and environmental mission—from the organic Heinz ketchup served to the tap water pitchers. 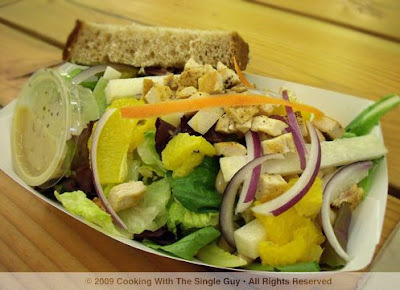 On one visit, I ordered the Grilled Citrus Chicken Salad ($6.45), which was a nice-size salad made with naturally-raised chicken, radicchio, red onion, jicama, orange segments and white beans. It’s served with a very light citrus vinaigrette. I was amazed at the freshness of the ingredients, which was more restaurant quality. In fact, the jicama was so fresh that it made me a convert for this crunchy white vegetable that I generally avoid because I thought it was bland. But I realized that when fresh, jicama can be slightly sweet and fun to eat. This isn’t a salad that will win for flavor because it tastes very light and healthy. But I felt it gained points for freshness and the nice portion size. On a subsequent visit, I checked out the 100 percent naturally raised beef used in the hamburger ($3.75). I topped off my burger by adding avocado for 75 cents. The hamburger was a bit tiny, but it was piled on with avocado, tomatoes, lettuce and pickles (I asked it be made without onions). While the beef patty wasn’t necessarily cooked like at a restaurant (translation: a bit dry), it was still enjoyable, especially when I lathered it with ketchup. And I liked the warm, slightly toasted bun. The fries were nicely thin, resembling real French fries. But of course, they weren’t as crisp as deep-fried fries. Still, they gave me the feel of eating French fries because of the texture and feel in my hands. To some, it might just seem like a somewhat soggy French fry. Given the health benefits of having them baked, I didn’t mind the slight sogginess since I have an aversion to deep-fried foods. While the food might lack a bit of flavor, Amanda’s is a real refreshing find and priced to compete with any of the major fast-food chains. 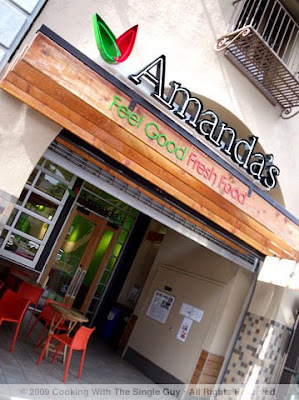 If you want something fast and convenient but don’t want to feel guilty about it, make Amanda’s your next stop. I’m not giving this my regular rating system since Amanda’s isn’t a full-fledged restaurant, but I would definitely go back. 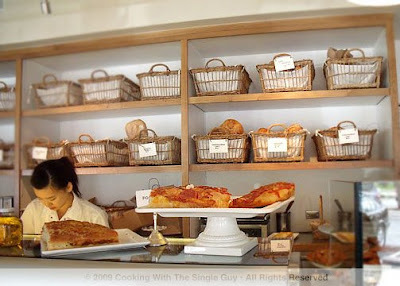 After my lunch with Food Gal last weekend at Calafia Café, I visited the also new Mayfield Bakery. 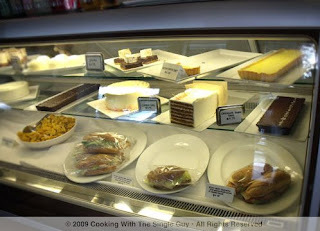 The bakery is attached to the Mayfield Bakery and Café at the Town & Country Village shopping mall. The restaurant actually seems busier than Calafia, and also a bit pricier. But next door in the tiny bakery, you can purchase sandwiches to go, pastries, desserts, hand-made candy and loaves of rustic bread. 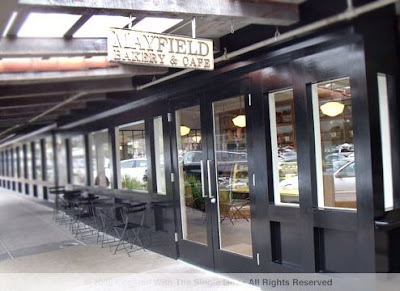 Mayfield is the latest operation from the Bacchus Management Group (Spruce, Woodside Pub and Pizza Antica) and the bakery is overseen by pastry chef Nancy Pitta, formerly of Boulevard in San Francisco. I definitely got myself a loaf of the ciabatta bread, which Food Gal highly recommended. It was really airy and light with a nice crust, and I ate it over several days making a grilled chicken sandwich with spinach and Caesar dressing. It was delicious with the ciabatta, which I lightly grilled. The display case had a lot of tempting desserts, but I was concerned about keeping anything I got refrigerated as I traveled back by Caltrains to the East Bay. But Food Gal was a bad influence (or, I guess, a good influence depending on how you look at it) and convinced me to buy something to eat on the train ride home. So I got the lemon drop because I was just mesmerized by how it looked so perfectly round, seeming to give off a yellow glow under the counter’s fluorescent lights. I thought it was smart how they placed the lemon drop (shaped like a char siu bau!) on a little disposable tray with a tiny handle so you could lift it without touching it. Inside, the lemon drop was a light cake with a custard filling. While the cake was light and fluffy, it didn’t have a strong lemony flavor—and I love my lemony flavor. So I have to say that it was subtle in flavor and not very bold for a lemon drop. Mayfield Bakery seems like a fun place to shop for fancy bread and those special treats. Looks like another nice option for the foodies on the Peninsula, helping them save gas by not having to drive into San Francisco. 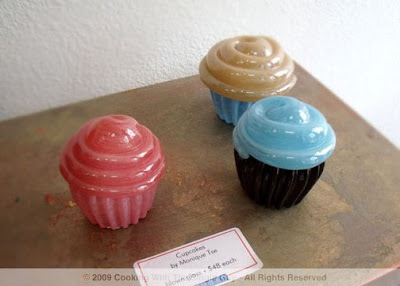 Even when I try to take a break from my food blog, I still stumble upon some kind of food event. That happened to me a couple of nights ago when I went to the world premiere of the independent film “White on Rice” as part of the 27th San Francisco Asian American Film Festival. Despite the name, the film has nothing to do with rice. So it was just going to be a night out to watch a new film by director Dave Boyle (not to be confused with Oscar-winning director Danny Boyle). But prior to the screening, the film’s sponsor, Iyemon Cha, hosted a reception for the cast and invited guests. (Basically, anyone who signed up for an invitation on its site was invited.) So I got myself an invitation and packed up my handy pocketsize digital camera and the result was yet another food post. 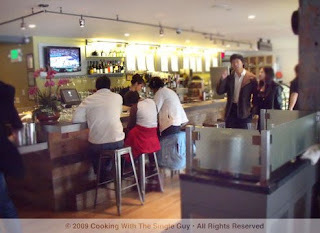 The reception took place at the Bar Bistro at the Sundance Kabuki Cinemas, the main venue for the film festival. I’m guessing the food came from the restaurant operations, which I blogged about when the Kabuki re-opened under the Sundance name in 2007. Here’s my plate of free grubs. 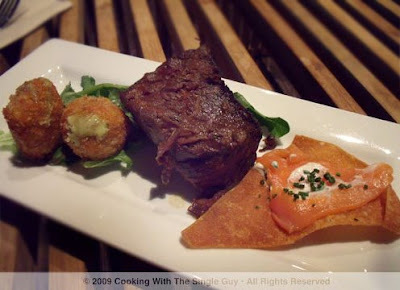 From the left there are a couple of crab balls (nice crab meat, OK flavor), a honking big chunk of braised short ribs (I wished they served it in smaller pieces and in a bun) and smoked salmon on a tortilla chip (the smoked salmon had an incredibly intense flavor that I liked). I called this dinner. 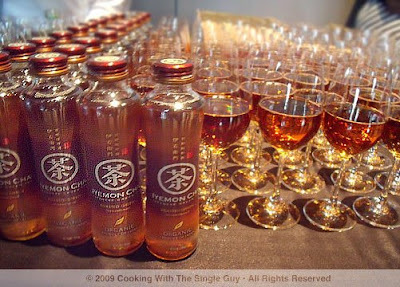 Since the sponsor of the event was Iyemon Cha, that was the only beverage served. I had never heard of Iyemon Cha, which produces bottled tea drinks. 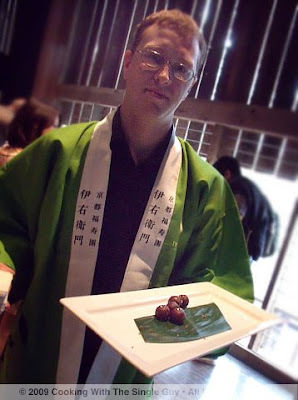 This night they served their original green tea and roasted green tea flavors. I tried both and I have to say they were kind of flavorless, almost like water. There wasn’t a strong tea flavor and it wasn’t really sweetened. (I heard many people say the tea was like water.) Thanks for the free grub though! 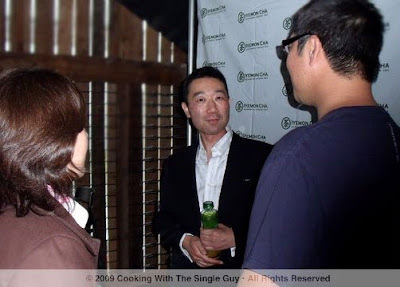 Here’s the star of the film, Hiroshi Watanabe, talking to a couple of guests. The film is a quirky comedy about Watanabe’s character, “Jimmy,” who is a 40-year-old divorcee and a bit of a child trying to find love. It has flavors of “Little Miss Sunshine” and also stars (in a supporting role) James Kyson Lee of “Heroes.” It was an entertaining film, and like all quirky comedies there’s a child star who’s adorable, and that comes in the form of newbie Justin Kwong. Here’s the official site where you can check out the trailer and see where the film will be playing next. (If you’re in San Jose, you can get rush seating when the film plays as part of the festival Friday night, 3/20, at 7 p.m. Get details here.) The San Francisco Asian American Film Festival wraps up this weekend, so rush out to catch a film, and maybe some free grub! I rarely make a trip down to Silicon Valley because BART doesn’t extend that far, but last weekend I hopped on the train down to Palo Alto because I had lunch plans with the Food Gal. The Food Gal and the Single Guy used to work together at the San Jose Mercury News, when we were just known as Carolyn and Ben. (She in the Food Section, ’natch, and me in Business when I used to care about all this stock market mess.) 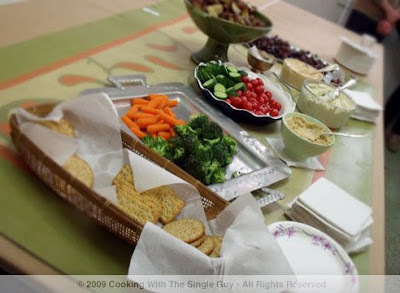 We got together to catch up and compare notes about our fledgling food blogging experiences. Our lunch spot was the newly opened Calafia Café by Charlie Ayers, the chef known mostly as the guy who fed the masses at Google’s free employee cafeteria. The idea was that the poor Google employees worked such long hours they needed a place for gourmet lunches and dinners to keep them happy (the top salaries and stock options didn’t hurt either). 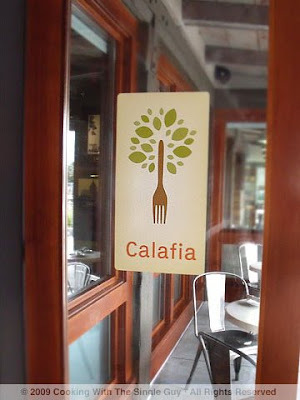 Calafia is located at the Town & Country Village shopping mall, which for years have been eclipsed by the nearby Stanford Shopping Center but has been undergoing a rejuvenation of late with the arrival of such foodie spots as Kara’s Cupcakes and the Mayfield Bakery and Café. When we arrived for lunch at 1 p.m., we didn’t have a problem getting a table in Calafia’s large space. 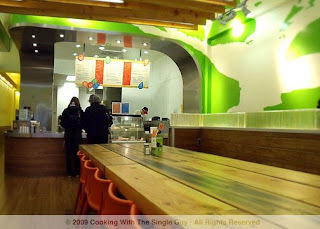 It’s a casual, family-oriented dining spot with several interesting eating areas created to fit your mood. There’s a huge communal table at the front, a dining area with small tables in the center and a long counter facing the open kitchen. Food Gal, who came for a preview when the café first open, pointed out the interesting reclaimed wood used for the décor and the amber-glowing chandelier made of recycled milk bottles. Off to the side is the recently opened Market A-Go-Go, where you can purchase take out items and local, sustainable food products. When I looked over the menu, I have to say I was disappointed to find out that Calafia serves only brunch on the weekends. Don’t get me wrong, I’m a big brunch person, but I had my heart set on trying some of the interesting appetizers and entrées I saw listed for lunch and dinner on Calafia’s Web site. The brunch menu offered some of the typical eggs and breakfast dishes like omelettes, French toast and “fluffy” pancakes. But it also included some entrées that reflects Chef Ayers’ tendency to fuse global flavors in dishes using fresh, healthy ingredients. 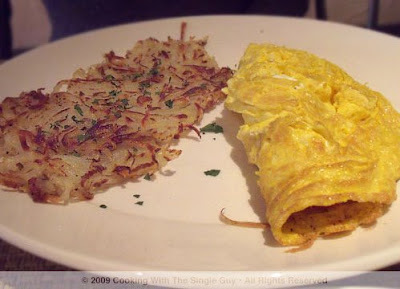 Food Gal ordered the daily omelette ($9), which on this day was made with smoked salmon and cream cheese, and served with hash browns. When her plate arrived, it looked pretty straightforward. Food Gal said she really enjoyed the taste of the smoked salmon inside. I decided to order something different and got the Five-Spice Chicken Fideo ($9). Fideo (as explained later by Chef Ayers who happened to spot Food Gal and came over to our table after lunch) is a Mexican short noodle that’s toasted first. The noodles are as thin as vermicelli or capellini. 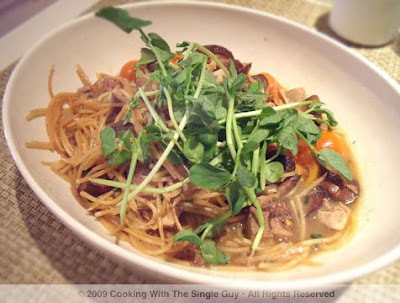 My chicken fideo came in a bowl dressed in a simple light sauce made up of juices from the ingredients, which included tomatoes, mushrooms, mint, cilantro and basil. The bowl was topped off with a heap of pea shoots. The chunks of chicken in the dish had a nice five-spice flavor that wasn’t overpowering but pleasing. Still, I felt the sauce was a bit too wet making it difficult to eat the fideo without worrying about making a splash with every bite. It did seem like a very healthy, light lunch, however. Since it was a light lunch, I decided to order dessert. 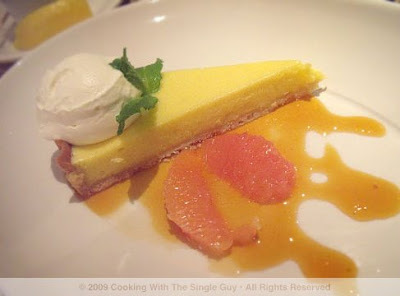 I got the Meyer Lemon Tart ($8) with a citrus sauce. The slice of tart looked very yellow and tasted very lemony, and I enjoyed the slices of fresh grapefruit and citrus sauce. But the crust was too soft for my taste, blending into the lemon custard instead of providing a nice contrasting texture. Side note: While I thought the service was efficient, I did sense a lag between the time we order things and how long it took to get to our tables. Calafia Café is a beautiful space that smartly reflects the fresh environment of California—in look and taste. And at its price point, it definitely has the feel of a fancy cafeteria rather than a destination restaurant. I’m not giving my usual ratings for this review since we didn’t really eat that much to get a sense of the menu, and I don’t really have the opportunity to come back often. It does seem to be a nice casual option among the offerings at the Town & Country Village. Can it be? 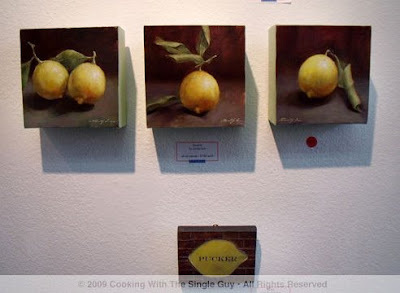 People going crazy over a painting of asparagus or a few simple lemons? That’s what it was like yesterday when I checked out the new “Delicious” exhibit at STUDIO Gallery in San Francisco's Polk Gulch neighborhood. STUDIO started in 2003 on Polk Street and recently moved to a larger space across the street. 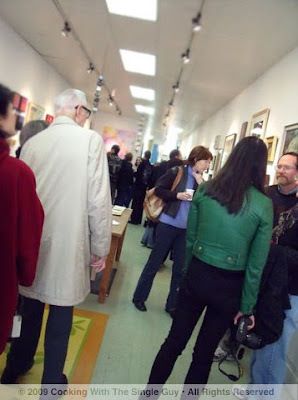 But even the larger space could barely fit the crowds gathered for the opening reception of the Delicious exhibit. The place was packed when I arrived in the afternoon. 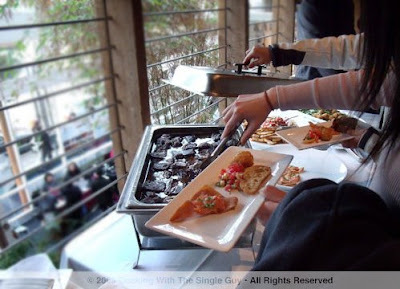 It probably didn't hurt that they were serving free drinks and a healthy spread of gallery munchies. In the back busy describing his cheese spreads to art-loving foodies was Ray Bair of Cheese Plus, which is a few blocks away from the gallery. 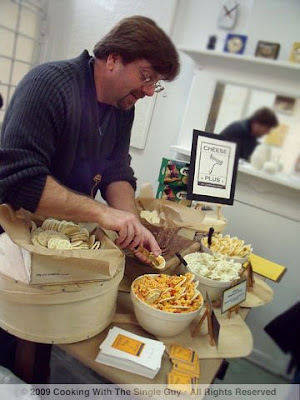 Ray offered up three types of cheese spreads that he normally sells at his stores. I loved them all, including one with ale. 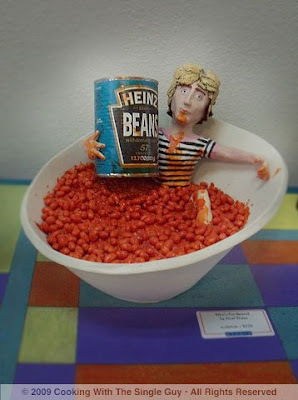 You can view more images of the artwork from the exhibit here. Or you can just get yourself to STUDIO and catch the exhibit, which runs until April 12. Here's my tribute to perfection. Sometimes you see a fruit that is so smooth and perfectly round, it just draws you to it. Well, me maybe since I am the fruit whisperer. 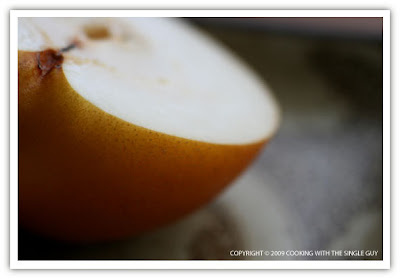 Wandering the farmers' market recently, I spotted this Shinko Asian pear and its smooth skin, perfectly round shape and golden color just made me have to take it home and make it my next model.